Working in the wedding industry we work with a plethora of vendors everyday. Some of these vendors end up being more than just work buddies; they become real lifelong friends. So when Katie told me who we would work with on her wedding day I knew it would be more than amazing! 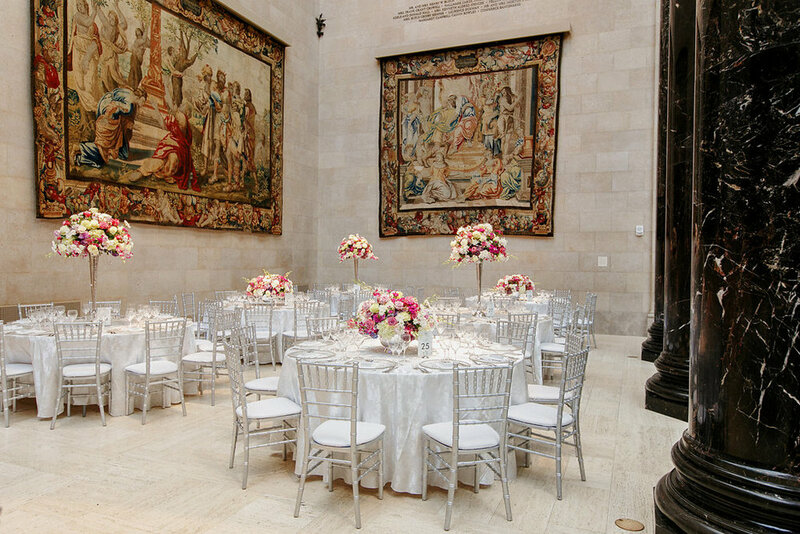 The Neslon-Atkins Museum of Art was the perfect location for Katie and Philip's wedding. They had originally considered her parent's backyard but that would require putting a dance floor over the pool, a maze of attached tents, motor coaches to transport guests from distant parking locations, caterers working from the house next door and mega prayers for gorgeous Kansas spring weather. So once they toured the floor plan at the Nelson, it became quickly apparent that this was the only way to go. When guests entered they walked through the galleries to arrive at Rozelle Court for the cocktail hour. We placed arrangements on the cocktail tables and the fountain in the center of the room that also held light up floating orbs. For a grand reveal, Grand Kirkwood Hall had been draped. So when the bells chimed the curtains were pulled back for the 300 plus guests to enter Kirkwood Hall. The Nelson-Atkins Museum of Art Wedding – Katie and Philip – Sneak Peek Wedding Video from creative films on Vimeo.